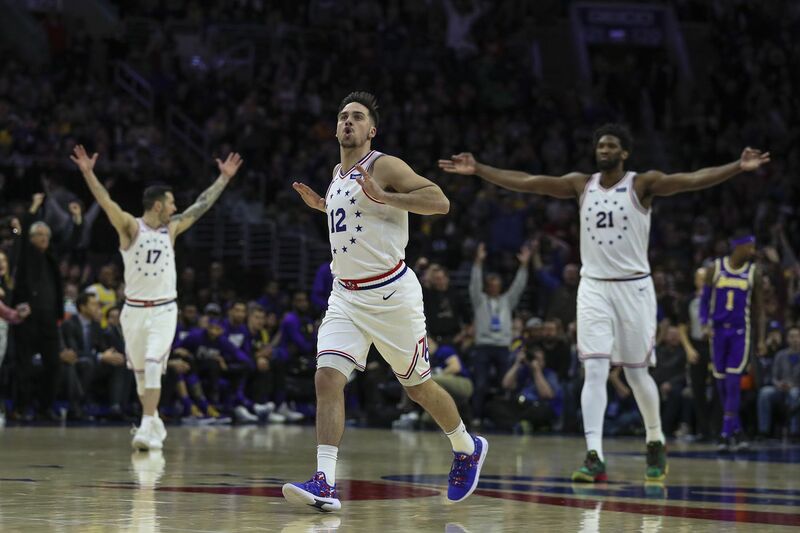 T.J. McConnell (center) celebrates after hitting a three-pointer with JJ Redick (left) and Joel Embiid joining him elsewhere on the court. It was a strange thing to see. Not only was the team with LeBron James not the best team on the court, but it was inferior in a definitive sort of way. This was something that Tobias Harris and Mike Scott were talking about at halftime. Both of them had been on talented teams before. Scott, for one, had played in an Eastern Conference Finals with the Atlanta Hawks. But this? This was different. After two quarters of action against arguably the greatest player of all time, the Sixers had a nine-point lead. Yet as they returned to the locker room for the intermission, it felt like they were down by 19. And you know what? LeBron knew it. He had to. For most of his 33 minutes on the court, he looked passive, ambivalent, borderline disinterested. He finished with 18 points, his lowest total in as many minutes of action this season. He turned over the ball four times. Most significant, he could do nothing to stem or counteract the tide of a relentless Sixers attack that just kept on coming. Maybe it was the first 12 minutes of the game that robbed him of his life force. The Lakers spent the first quarter doing just about everything they possibly could have hoped from themselves. They scored 40 points. They knocked down 14 of the 25 shots they took. They got 23 points from second-year forward Kyle Kuzma. And, after all of that, they had a lead of exactly one point. LeBron James gestures towards a teammate during the second quarter of Sunday's game. Toward the end of that opening period, James went to the bench, and was followed a few minutes later by Kuzma. Meanwhile, Joel Embiid returned from his first stint on the bench, and the game was henceforth decided, with the Sixers cruising to their second-highest scoring output of the season, while becoming just the eighth team in the last eight seasons to score 143-plus points while hitting 12 or fewer three-pointers. After it was over, coach Brett Brown acknowledged that the final third of this season will involve a heavy amount of experimentation, that finding the optimal personnel pairings and substitution patterns could take some work. At the same time, he called that a good problem to have. And it is. Against the Lakers, the Sixers played 48 consecutive minutes of basketball with at least two of Embiid, Harris, Jimmy Butler, Ben Simmons, and JJ Redick on the court. The vast majority of that time featured at least three of those players, each of whom possesses a unique enough skill set that some sort of mismatch is virtually guaranteed. Case in point was a lineup that included Scott and T.J. McConnell with Redick, Butler, and Embiid, which spent most of its time on the court together facing a Lakers five that included neither Kuzma nor LeBron. That particular Sixers lineup outscored the Lakers 22-8. “I think we have a lot of different options out there that we can go to and change up things in terms of who needs shots, where shots are coming from,” said Simmons, who felt comfortable enough to attempt what might have been the first non-desperation three-point shot of his career (it rattled in and out). For the new starting five, their first two games together will be little more than a prelude once Tuesday rolls around. That’s when Brown will face his first significant chance to show that last year’s playoff loss to the Celtics was chiefly a matter of the personnel he had at his disposal. Since the start of last season, the Sixers have lost nine of the 11 games they have played against Boston, five by double digits. With Embiid playing at an MVP level, there is a very good argument to be made that the Sixers now own the strongest starting five in the Eastern Conference. Nothing about what we have seen though their first two games together should detract from such an argument. “There was a fast-break play, I think it was in the third or fourth quarter, when we had like four to five passes for an open three that I hit,” Harris said. “Just that type of momentum and that type of spirit of the ball, moving side-to-side, that’s fun to be a part of and fun to play with." It’s only going to get more fun as these guys play together. It is not a perfect rotation. There are holes. Another guard would be nice. The defense behind Embiid remains suspect. But everything we’ve seen so far suggests a Finals berth is within the realm of possibility.